On your Android phone, you can use the Maps app to find a business, restaurant, or point of interest. You may not know an address, but you know when you crave sushi or perhaps the exotic flavors of Kamchatka. Maybe you need a hotel or a gas station or you have to find a place that patches toupees. This search text locates movie theaters on the current Maps screen. Or, to find locations near you, first tap the Location icon and then type the search text. 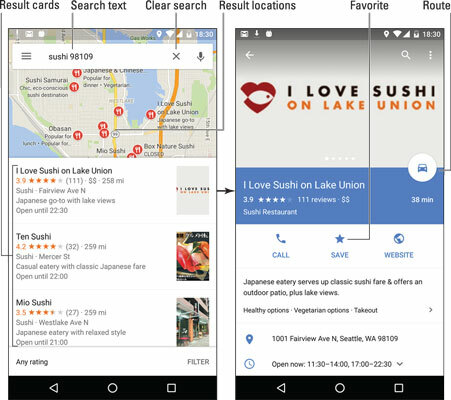 After typing this command and tapping the Search button, you see a smattering of sushi bars found near downtown Seattle, similar to those shown on the left side of the following figure. Search results for sushi in Seattle. To see more information about a result, tap its card, such as the one for I Love Sushi on Lake Union. To get to the location, tap the Route icon on the location’s card, as illustrated in the figure. Every dot on the screen represents a search result. The search results card (on the right) lists business hours as well as other information. Tap the Call icon to place a call. Tap the Website icon to visit the location’s website, if available. If you really like the location, tap the SAVE (Star) icon. That action directs the Maps app to keep the location as one of your favorite places. The location is flagged with the Star icon on the Maps app screen. When you can’t make up your mind or you just want to see what’s out there, tap the Location icon and choose the item Explore Food & Drinks, found at the bottom of the screen. Peruse the list of locations to find something interesting.